I live so damned close to Fenway Park, I could go to every game, but seat prices are so expensive that I only get there one or two times a season. Today was one of those occasions, thanks to a pair of subsidized tickets I bought through Suffolk University. The tickets were really for last night, but due to a near-miss tornado that caused freakish rain, Game 20 was delayed until today at 12:35PM. The rain didn’t stop my friend Mike and I from catching up, beginning with dinner and drinks at Boston Beer Works, and later more beers and people watching at GameOn, which was my first time in that Lyons Group bar. The downstairs room with its rectangular bar and dozens of widescreen TVs reminded me of the simulcast racing room at Foxwoods. Fun times there, and I ran into some fellow Suffolk graduating classmates. But I digress. Back to today’s game. The seats were in Section 4, Row 13, where we stayed for a few innings before moving down to Row 8 for a better view. Surprisingly, the park was nearly full despite the rescheduled game for a weekday mid-day time. Did everyone call in sick?? 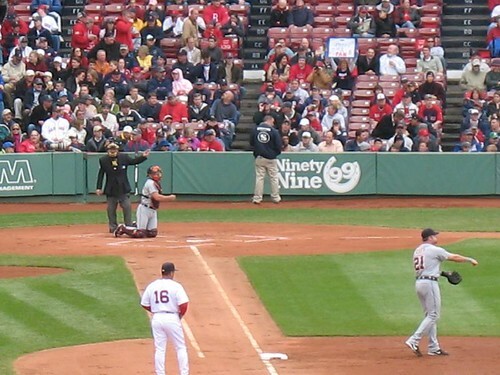 During my adolescent years, I always went to Fenway with my parents and always sat in the bleachers behind third base. More recently, I always sat in sections to the left of Pesky’s pole. 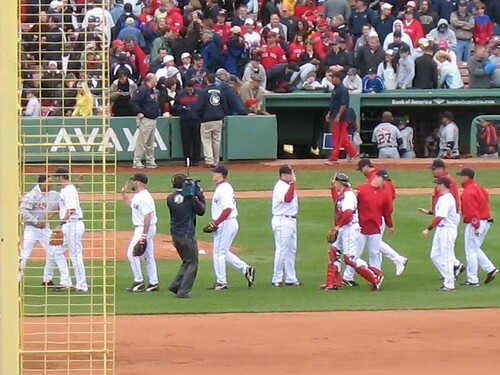 Neither Mike nor I have sat on top of the Green Monster, but this link by someone named Bev provides some useful commentary and pictures from those seats. Time will tell if I return to Fenway this season. If I do, it ought to be a warmer day! I enjoy receiving compliments. Who doesn’t? Fact is, I don’t receive them often. Over the past 24 hours, though, two different female friends told me I looked good. I feel good, hearing that. I know I look good; I’ve been pseudo-dieting, eating a lot of salads and nuts and low-starchy foods. Personally, I’ve gained an extra belt buckle over the past few weeks, and I know it shows. My mom says my weight loss shows in my face; I’ll take it any way I can. In May 2006, I spent three weeks in China, visiting Beijing, Shanghai, Guangzhou, Han Cunhe village, and Hong Kong. I am slowly posting stories about my Chinese experiences, visually aided by my photographs. I’d love to know what people think, so feel free to add a comment below if inclined. This story begins on a May afternoon in Beijing. I had taught myself how to navigate the subway system, and headed to the pedestrian-only shopping district of Wangfujing Street. The Times Square of Beijing, Wangfujing was riddled with brand name shops, street vendors, and bright neon. I was looking to buy a small backpack. In my quest for a backpack, I met a Chinese young woman who introduced herself as Jenny. She claimed to be a college student and parttime English teacher, and asked if I’d join her for a cup of coffee so she could practice her English. I don’t drink coffee, I told her. But she seemed nice, so I offered to drink tea with her. Jenny led me across the street, into a department store, past the leather goods section, up an escalator, past some musical instruments, and into the Dragon Spring Tea House. I thought it a little odd that a tea house was hidden inside a department store, but I had been in China a few days, so maybe this was some real estate gem. I saw a few staff milling about, but no customers. Oh, and I was also the only white person in the entire department store. A girl whose name I never caught, primarily because she didn’t speak English, ushered me into a private, draped room and the tea ceremony began. 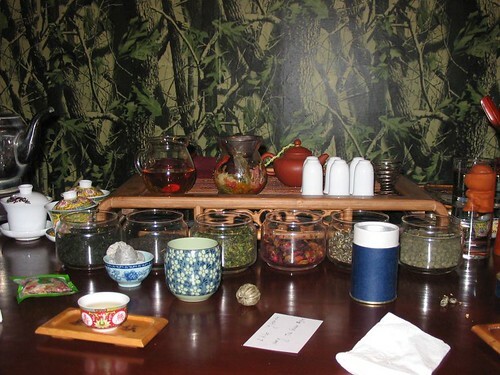 I was led on a tasting trip to oolong tea, green tea, black tea, hibiscus tea, jasmine tea, and several other teas. Maybe about eight teas. The whole experience lasted about an hour. AN HOUR! Something didn’t feel right. I asked for directions to the toilet, which was upstairs. A tea house staffer led me there, but then she stood guard while I used the bathroom. I thought about escaping, but where? How? I returned to the tea house, and was asked if I wanted to purchase any teas or tea cups as a souvenir. I pointed at the jasmine tea. The girl comes back with two boxes. One box for me, and one for Jenny. I didn’t ask; I just wanted to get out of there. I am presented the bill. Jenny is not reaching for her purse. I look at the total: 1658 RMB. The equivalent of $170. so offers to pay for her tea. Not the ceremony, just her box. What can I do? I whip out my Visa, and sign away $170. No description on the receipt. I make note of the name and location of the shop on my way out. 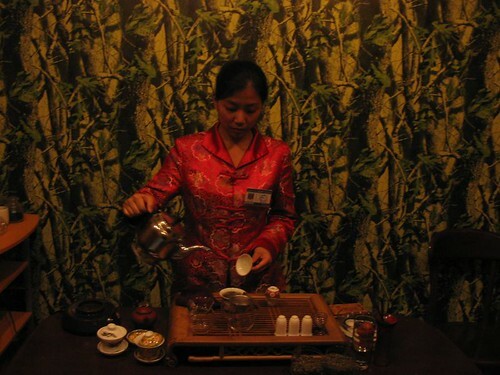 I later learned that tourists from English-speaking countries were constantly exploited in what is known as the so-called Beijing tea house scam. That night, while staying in a dorm room at the University of International Business and Economics, I googled (from google.cn) various keywords and discovered the scam and suggestions for financial relief. In the end, the experience with Jenny and the teas was a positive experience, for it became fodder for stories, such as this one. Great stories usually involves a cost, financial or otherwise, to be appreciated, don’t you agree? EDIT: You can see a similar story by Mike here. Two weeks ago, I learned my college friend Steve Guo died of an acute asthma attack. During college, Steve was a regular player at a weekly neighborhood poker game. We never grew extremely close, but we befriended each other due to our eccentric quirks. He was one of the kindest men I knew. When I heard of his death from a mutual friend, I hadn’t seen Steve in about seven years. He was living with his fiancee in South Australia, where he worked as a research assistant in the University of Adelaide’s biochemistry department. Also last month, I learned the journalist and political satirist Molly Ivins died of cancer in January. I don’t know how I missed the news at the time. While I never read her books, I saw her speak, shortly after the publication of “Shrub,” at the 2002 Nieman Conference on Journalism, which I attended as a freelance writer. She keynoted one of the sessions, and I enjoyed hearing her media and political tales. I used to attend journalism conferences. For two years, I frequented the Nieman conferences in Boston, and the American Society of Journalists and Authors conferences in New York. In 2003, I took the advice of colleagues and attended a conference through the South Asian Journalists Association, held at Columbia University. Now, I’m not Asian, nor am I married to an Asian, and I certainly didn’t write about Asia, but I attended the SAJA event to get tips to boost my then-fledgling writing career. As one of the few white-skinned men attending the SAJA conference, I recall Peter Jennings looking in my direction as he scanned the audience before speaking on the first morning. I don’t remember what he said, other than working in Bhutan and becoming familiar with South Asian politics. After his speech, I walked up to him, shook his hand, and we exchanged pleasantries about being the minority in the room. He was very cordial and kind. When he died, I remembered our dialogue and smiled. As I journey through life, I remember people who had an impact on me. Molly, Peter, and Steve Guo impacted me for different reasons but I remember them. I am not a US Army historian, but I recognize the charisma and motivational leadership that Patton instilled in his troops in both world wars, especially during his command of the 7th Army’s invasion of Sicily in July 1943, two years before he died. Over the years, I held numerous jobs that fit the category of being told how to do something. Once, I was shown how to spray plants at a nursery. Another time, I was told how to insert miniature sponges into plastic pouches, and later how to seal them. The best example comes from McDonald’s, when I was told how to remove frozen chicken nuggets from a wrapper and fry them until the timer stopped. Come to think of it, most high school-era jobs involve employees being told how to do things. I understand the rationale, but that doesn’t make it right. This literary excerpt was the basis for my last blog, titled vacilamos, named for the first person plural of the present indicative tense. In retrospect, I should have picked a less clever and more common word, one that non-native Spanish speakers could pronounce, let alone comprehend. Great book, though. I appreciate the concept of vacilando because it evokes more than wanderlust, but the enjoyment of travel for the experience, not necessarily its destination. In 2001, I clocked 20,000 miles and six months through 20+ U.S. states and half of Canada. I drove where I went for no reason than to go. That’s vacilando, and that’s part of my life. I don’t remember where I saw this quote, because I haven’t read the book. It’s on my reading list, though. I appreciate the imagery, and I wholeheartedly agree. I keep a journal when I travel, never in my secular daily life. Which begs the question what this blog represents. Maybe I’m maturing. Like my peers in the so-called Generation X, I held numerous jobs over the past decade. I’m currently in my third career. My experiences caught up to me, though, and I found my calling. I’m riding the carousel of life and I’m reaching for the gold ring. I know what I want to do, and I am prepared. Please visit this link for updated information.